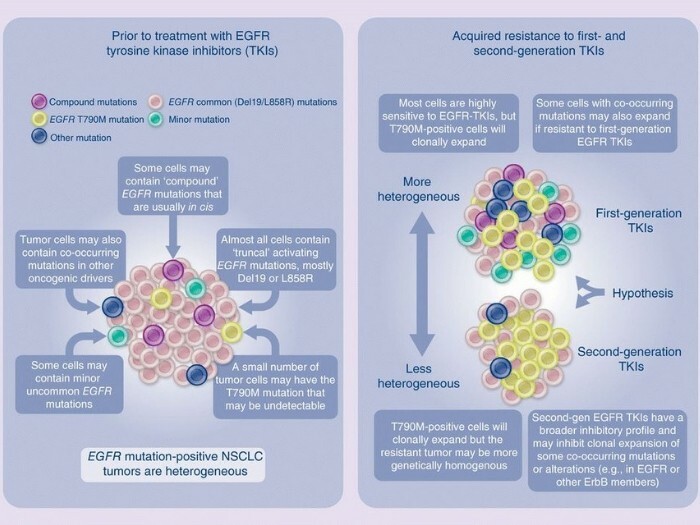 While the development of epidermal growth factor receptor (EGFR)-targeted tyrosine kinase inhibitors (TKIs) has revolutionized treatment of EGFR mutation-positive non-small-cell lung cancer (NSCLC), acquired resistance to therapy is inevitable, reflecting tumor evolution. Recent studies show that EGFR mutation-positive NSCLC is highly heterogeneous at the cellular level, facilitating clonal expansion of resistant tumors via multiple molecular mechanisms. Here, we review the mechanistic differences between first-, second- and third-generation EGFR-targeted TKIs and speculate how these features could explain differences in clinical activity between these agents from a clonal evolution perspective. We hypothesize that the molecular dissection of tumor resistance mechanisms will facilitate optimal sequential use of EGFR TKIs in individual patients, thus maximizing the duration of chemotherapy-free treatment and survival benefit.